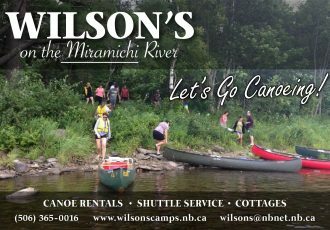 Wilson’s on the Miramichi River also offers housekeeping units to anglers who wish to save a few bucks by shareing the cost of lodging with your friends and enjoy cooking their own meals . The Big Murphy Cabin ( air conditioned )shown here, has a spacious well equiped kitchen and dinning room , a comfortable living room , four bedrooms that have a total of two double beds and four twin beds , two bathrooms and two large screened- in verandas . A gas bar-b-que is an obvious amenity at any housekeeping cabin but the fire-pit at Big Murphy is probably the most popular outdoor activity on site , aside from fantastic fishing of course . The cabin is situated on the water but far enough from the fishing pool that non-fishing guest’s can enjoy a swim out front without disturbing anglers . Our canoe rental service works great too , we are a comfortable 3 or 5 hour canoe ride right to your front door . For the serious angler , you have easy access to 16 private pools . We also provide top rate professional guides for non-residents , or to resident anglers who wish to learn a few tricks of the trade from a real pro . If you prefer to just kick back and watch the river flow by then Big Murphy can be your little piece of heaven . We are located just minutes from two beautiful golf course too .